Dunedin, FL., November 5, 2016 – The first inning was about the closest frame of the entire contest in the 55-and-over ‘wind jacket’ championship game played Saturday afternoon at Florida Auto Exchange Stadium. With both teams making far trips to play in Florida, many on hand expected a tightly contested game. Team Puerto Rico after the opening frame went on to scatter 12 runs over the next seven innings of play to easily get by Philadelphia-Chicago Coalition 14-6. Puerto Rico amassed 22 hits and took advantage of three errors made by Philadelphia-Chicago. In a game where Puerto Rico led by as many as 10 runs at one point, Philadelphia-Chicago was never able to fully regain its footing after the initial 2-2 tie. Everything started off great for Philadelphia-Chicago in the top of the first inning, as Larry Greenwich singled home two runs to give the Coalition a 2-0 lead. Puerto Rico matched their opponent’s opening frame with a couple runs of its own to tie the game up at 2-all. From there, it was practically all Puerto Rico. Over the next seven innings of play, Puerto Rico would ahead and score multiple runs in five of the frames, including six runs between the fourth and fifth. Garcia named Victor Martinez the tournament’s Most Valuable Player and for very good reason. Martinez’s play on Saturday was near perfect for Team Puerto Rico, going 4-for-4, with four singles on the day. The Coalition tried to make things interesting in the top of the eighth inning, when Philadelphia-Chicago were able to plate Larry Bowstring and Don Cooper and cut Puerto Rico’s seemingly large deficit down to 12-6. 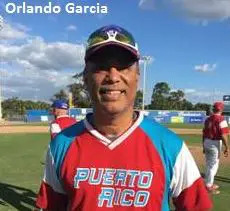 Garcia’s club made sure there would be no comeback attempt, as they scored two runs in the bottom of the eighth to make the game out of reach.